GES, Incorporated in Delaware on February 25, 2015, is a full service election company that has developed a proprietary software system utilizing advanced OMR/OCR/Barcode software featuring de-skewing, de-speckling and image correction, and is creating and implementing data storage and retrieval registration system using blockchain technology for elections specifically. GAHC signed a letter of Intent to acquire the assets of Election Services Solutions including all clients, contracts and employment contracts. This asset purchase is currently pending. GES’ senior staff has been supervising elections since 1981, having managed over 8,500 elections involving more than 40,000,000 voters – none of which have been overturned. Through relationships and a strong reputation in the industry, GES has an impressive customer list of over 100 labor unions, numerous associations and has done business with credit unions. GES has signed a term sheet and is working with HCAS Technologies, (HCAS) to design and create information technology and information systems management including software development services, infrastructure, network, support, corporate security, and risk management. HCAS works with other leading organizations to provide collaborative solutions to their Business and IT challenges with innovative ideas that are embraced by their customers. HCAS offers information technology administrative services on a highly configurable, rules-driven risk management system that helps customers reduce administrative costs and increase profitability while increasing consumer satisfaction. The company has developed a suite of software solutions utilizing an advanced set of proprietary technologies and focused on risk management solutions, which generate revenues to existing businesses. More than 25 professionals leverage in-depth industry knowledge across various verticals including Banking and Financial Services, Healthcare, and Insurance to deliver robust digital solutions in critical areas of client growth. HCAS is a unique technology company that specializes in business process improvement and automation, helping organizations optimize their underlying processes to achieve more efficient results. Given HCAS’ extensive background in healthcare and specifically in Information Security, Privacy and Regulatory Compliance related services, organizations have chosen HCAS to be their advisors. Years of direct front-line, real-world experience with deep privacy and security skill-sets helps clients assess and implement the required people, process and technology controls cost-effectively. HCAS will be assisting GES to implement programs that will assure continuous compliance with Department of Labor, US Board of Elections, National Institute Standards and Technology, Payment Card Industry, HIPAA-HITECH Security, Privacy and Data Breach Notification Rules as well as other data protection regulations with which GES must be compliant. With an extensive technology portfolio, enhanced with its content production resources, and software development expertise, HCAS is positioned to deliver an exciting new approach to voting technologies that increase the transparency, efficiency, and integrity of elections while making voting more accessible. Ballot Creation: A system assisted means of creating the ballot within the conditions that exist for the particular voting event. The system will have the ability to develop ballot pages while maintaining uniformity of the content and compliance. Exporting methods will be in place to manage digital files presented to the printer. Version & content control measures will be maintained for all ballots created. Registration System: Phase 1 design will allow for a secure database management system to import and organize registrants as necessary to support multiple methods of voting registration, to include paper ballots, on-line, and digital voting. Further the technology will support data import, export to third parties, categorization, and encoding of registrant information. Phase 2 design will support the application of the encrypted hash key and integrated digital token assignment to each registrant as a means of securely validating each registrant. This digital key will then be integrated and applicable to the blockchain. Scanning of Ballots: Technology provided will support and integrate with GAHC’s 3rd party scanning partner’s application. During the initial business requirement discovery phase, we will review the current technology to determine the software integration, operability, and quality with our designed system. Scanned data must be able to be validated against our verification algorithm. Private Secure Cloud / Data Warehouse: Synectic Advisors technology operates in a secure hybrid mode. Therefore, some software with associated drivers will be installed on local computer equipment and the primary system will operate off-premise in a private cloud environment. A management console with associated auditing features is included in the design. Scanned ballots, data extracted from the ballots, and further validation methods are processed and stored in a private secure (encrypted) data warehouse segregated by election event. Reports will be generated and accessible from a secure cloud portal. HCAS identified Imaging 101, a technology company based in Ft. Lauderdale, FL that worked with GES to create a very specific registration software that functions in authenticating and registering voting members in a data look-up system. It is mission critical for the Company to build a system that keeps members information secure. The registration system will further be developed to leverage the advanced security and transparency features intrinsic to Blockchain Technology. In the event of an in-person election, a voter ID can be scanned or any information typed into the system to retrieve the voter information. A digital signature can also be captured and saved for the final list of ‘Who Voted”. In the event of a Mail Ballot, a barcode on a Business Reply Envelope is scanned and the status of that member is identified. If the member is not eligible to vote, that ballot is removed from the count. Because we must account for every single ballot, the system has multiple reporting options where we may deliver to the client the list of members who mailed in a ballot but were not able to vote, detailing the reason. The software is advanced OMR/OCR/Barcode scanning and tabulation software featuring de-skewing, de-speckling, and image correction. The computer hardware was designed to operate without dependency on the Internet or Wi-Fi access and therefore is hard-wired, ensuring complete security. The system allows for triple auditing capabilities, which consists of 1) electronically generated tabulation results; 2) jpeg imaging and storage of the scanned ballot, and 3) archival of the original physical ballot. This advancement gives GES the ability to tabulate elections faster and more efficiently, and brings the opportunity for GES to compete for larger elections. GES began deploying this system in our elections during the third quarter of 2017. The Company plans to enter the US Government elections market in the 1st quarter of 2018, providing registration and software solutions for paper ballot elections administered by US municipalities. We intend to use our new registration and OMR/OCR/Barcode in Paper/Mail Ballots and incorporate our newly developed registration system and wherever possible, specific registration systems based on US Patent #9,608,829, issued March 28, 2017; System and Method for Creating a Multi-Branched Blockchain with Configurable Protocol Rules which claims priority over; Provisional application No. 62/090,370 entitled “Use of Blockchain Database to Enhance Security of Support Secure Electronic Voting and Election Result Tabulation” filed Aug. 6, 2014. The Company, along with its software developers, is also exploring other blockchain technologies for voter registration and election balloting. In the US there are 3,007 counties, 64 parishes, 19 organized boroughs, 11 census areas, 41 independent cities, and the District of Columbia, all of whom are going to buy updated Election Machines and Software in the near future. Each municipal county individually purchases election voting machines under the guidance of each State’s Secretary of State. In January 2017, President Barack Obama issued an Executive Order declaring United States government elections a “Critical Infrastructure”. President Donald J. Trump further extended this “Executive Order”. This means US Government will have a more active role in US elections. The National Conference of State Legislatures recently announced that 22 states have provisions allowing certain elections to be conducted entirely by mail. As of January 2017, 3 of these states, Oregon, Washington and Colorado hold all elections solely by mail. California will begin all mail in 2018. GES has a current client base of hundreds of unions. GES is committed to providing a comprehensive, secure voting platform, using state of the art technology for election officials charged with running their elections. GES has joint ventured with Voting Portals, LLC to use a proprietary software that not only allows for secure online voting, but also includes add-on features for our clients in a secure portal system such as posting documents like candidate statements, contracts or amendments to be voted on, streaming real-time or archived meetings or videos, sending real-time messages within the portal or tracking email communication to the membership. We also offer the option for a “hybrid” election, which allows members to choose between a Paper Ballot and Online Vote while ensuring no one votes twice. These tools can be useful between elections as well and is an excellent way for leadership to communicate with and engage their members. GES is working to build a user experience that limits human error and makes the voting process as smooth and seamless as possible while ensuring the highest level of secrecy, security and One Member=One Vote integrity that Management has been committed to for over three decades. In the fourth quarter of 2016, the Department of Labor released official guidelines for voting online. Since then, we have worked to develop our systems to offer our customers the most advanced software available today. This DOL announcement has encouraged many unions to look into this option because it is not only an easier process, but there is a significant cost savings for the client and a margin increase for GES. Organized Labor Unions and their memberships in the United States are represented at the Local level, the Regional level, and the International level. The smallest membership totals are at the Local level, groups of locals in a geographical area combine to make up a Regional level, and all members belong to an International Level. Elections occur in all these groups and subsets of them, which means that there could be multiple votes for the same union throughout the year, with GES charging a per-member fee for each one. Most Nominations and Officer Elections for union leaders occur every two to three years. Additionally, GES is regularly involved in other types of elections, including; Strike Votes, Contract Ratifications, Delegate Nominations, Dues Increases, Assessments, By-Law Changes and Unexpired Term Votes, all of which can be done online as well. Each union has by-laws that dictate the process and how often these elections occur. Due to our unique personal relationships with Local Union Leaders, it is a natural progression for GES to expand into administering Regional and International elections, which we have already begun to do. Below is a list of membership numbers for the top unions in the US, many of which GES already has as clients. The GES Team has been conducting elections for Homeowner and Co-Op Organizations for more than thirty years. At GES, we understand the sensitivity of the project, and the need to present a flawless experience to the owners. GES is the independent and impartial third party Organizations can trust to manage an election, and provide an Organization with the tools essential to strong leadership and good governance. GES provides complete management of an election project, from the initial design of voting materials through tabulation. We support in-person, paper mail, and Internet voting using ballots or proxies. Signature verification, slates, and weighted, or share, voting are standard. No activity proceeds unless there is a quorum present. Interim results are available immediately, and certified results usually follow within 24 hours. The GES Team has conducted elections at properties with fewer than 200 Membership Interests, and with more than 10,000. We have even conducted lotteries for public housing agencies including Section 8 Housing. Election security is an absolute priority for GES. We have seen emotions run high in many projects. Our focus on the security and confidentiality of election information diffuses most concerns, and creates a broad consensus that the project is being conducted correctly and impartially. Teller Committees regularly observe our processing and tabulation activities. Now more than ever it is important to know what property owners are thinking. For many clients, we've included a limited set of survey questions on the proxy for the Board election. This technique has proven effective in capturing voter interest and stimulating turnout, in addition to providing valuable feedback on the important issues. GES can develop a regular program of surveys to help the client more effectively gauge members' views on needed improvements, regulatory matters, or other association-related issues. This interaction is made even easier with our working relationship with Voting Portals LLC. Voting Portals, LLC is a privately-owned software development company based in Miami, Florida specializing in developing and operating proprietary online/e-voting software systems in various regulated election sectors including Condo/HOA; Labor Unions; Other not-for-profits; Shareholder; and Municipal. 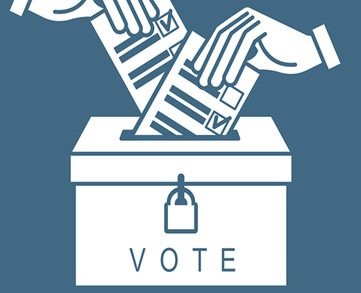 VP’s software systems deliver the most advanced platform today in online e-voting and related services allowing users to vote securely in elections and on other issues from anywhere by using encrypted voting codes, credential authentication, and blockchain technology. VP software complies with Florida Statute, Chapter 718 (the Condominium Act), providing a unique, password-protected, user-friendly portal experience for all association members and a secure voting platform to use for “consenting” members. The multi-functional Internet program allows users to vote in elections and on other association issues in a secure manner by using encrypted voting codes with multiple levels of credential authentication. Each portal can be fully customized including adding logos, links to favorite websites, photos and other images to create a familiar look and feel for each association. The dynamic software also allows users to be able to view video recordings and/or live streaming video of meetings, presentations, and other information, all from their mobile devices or computers. There is also the ability to customize menu buttons, upload documents, messages and other content an organization wishes to display, archive information, send emails and notices, keep roster information organized, and track voting and other status matters. Management sees this relationship as an opportunity to not only grow our Co-Op/Condo client list and expanding in multiple states, but also offering this secure online voting system to our existing customers and adding online customers in other sectors GES services. The Voting Portals platform is fully functional in the Co-op/Condo space in Florida and may be expanded nationwide in the community association sector of the US Housing Market. This will require the adaptation of numerous individual State laws and regulations. Keep up to Date and Stay Informed. Sign up for email alerts to receive company updates including press releases, filings and special announcements straight to your inbox! © 2012-2018. Global Arena Holding, Inc.